36 songs and chants + instrumental sing-along versions! 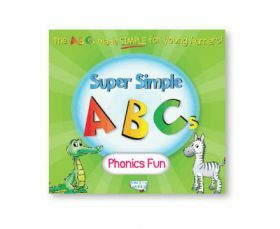 Super Simple ABCs Phonics Fun introduces young learners to the alphabet in a super fun, super simple way. The CD features an ABC hello and goodbye song, simple versions of the alphabet song and the phonics alphabet song, 26 songs introducing the sounds of all the letters of the alphabet, and review songs and chants. These are songs and chants young learners will be able to sing along with right away. The CD was designed to work well in support of the Super Simple ABCs Upper Case and Lower Case books. It also works great as a supplement to any ABC/phonics program, or on it's own! Please note: This CD includes updated versions of songs previously available on the CD from Super Simple Phonics (no longer in print), plus new several new songs.